Asphodelus is a genus of mainly perennial plants first described for modern science in 1753 and commonly known as Asphodels. The genus is native to temperate Europe, the Mediterranean, Africa, the Middle East, and the Indian Subcontinent, and now naturalized in other places. Asphodels are popular garden plants, which grow in well-drained soils with abundant natural light. 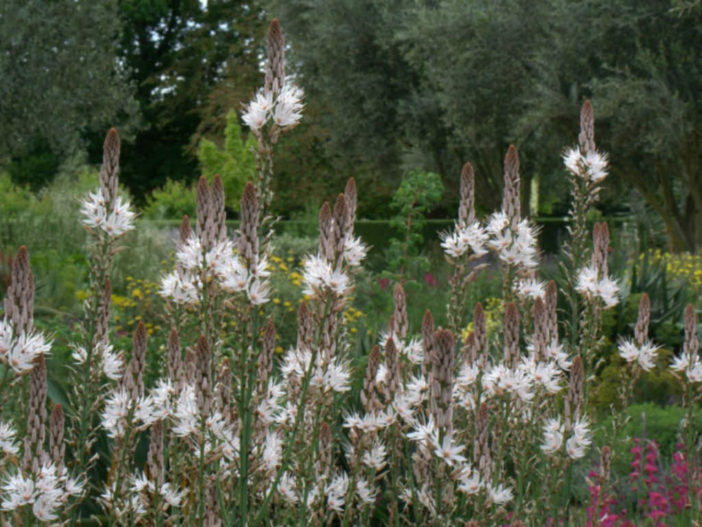 The plants are hardy herbaceous perennials with narrow tufted radical leaves and an elongated stem bearing a handsome spike of white or yellow flowers. Asphodelus albus and Asphodelus fistulosus have white flowers and grow from 1.5 to 2 feet (45 to 60 cm) high. Asphodelus ramosus is a larger plant, the large white flowers of which have a reddish-brown line in the middle of each segment. Grow Asphodels in moderately fertile, well-drained soil in full sun. Does not tolerate heavy, poorly-drained soil. Irrigate occasionally to very little in coastal gardens. Considered hardy to USDA zone 6. It tolerates temperature down to 14ºF (-10ºC). Great as a border or accent plant. Propagate Asphodels by seed, sown in pots in a cold frame in spring or propagate by division after flowering. Although you can cut back flower stems after flowering the seedheads are attractive so can be left.